A feat of repartee and wordplay from acclaimed director Emmanuel Demarcy-Mota and Théâtre de la Ville, Paris, Ionesco Suite comprises excerpts from the following plays: The Bald Soprano; The Lesson; Frenzy for Two, or More; Jack, or The Submission; and French Conversation and Diction Exercises for American Students, allowing audieno experience principal scenes and taste the tragicomic stylings of playwright Eugène Ionesco. Context is everything, so get even closer to the production with this curated selection of related articles and videos. After you've attended the show, let us know what you thought by posting in the comments below and on social media using #Ionescosuite. The actors and creators of Ionesco Suite provided texts of their own reflecting on their own experiences bringing the suite to the stage. Art’s relation to politics, Ionesco’s “total lack of methodology,” and the importance of literature figure heavily in this 1978 interview with the playwright. An interviewer sat with the Ionesco in the drawing room of his home in Paris in 1984 and discussed his origins, French poetry, and the influence of surrealism and psychoanalysis in his work. 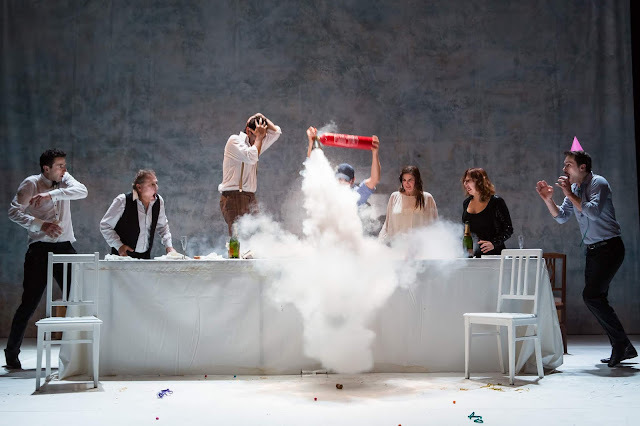 Ionesco Suite director Emmanuel Demarcy-Mota on his approach to production and theatre and what keeps drawing him to Ionesco’s plays. This insightful and extensive obituary includes a quote from Ionesco, written in his 20s, on why he wrote: "To allow others to share in the astonishment of being, the dazzlement of existence, and to shout to God and other human beings our anguish, letting it be known that we were there." This three-part interview filmed in 1961 touches on everything from Ionesco’s childhood and other aspects of his biography to his feelings on politics, philosophy, and literature. As if Ionesco’s work wasn’t surreal enough, this episode of The Moth includes the true first-person tale of a high school student attempting to pass an Ionesco play off as his own. How did you enjoy the show? Likes? Dislikes? Surprises? Tell us what’s on your mind in the comments below and on social media using #Ionescosuite. It was VERY hot in the theatre. My wife and I were very appreciative for this show's humor and the wonderful actors. Theatre of the Absurd can at times be heavy handed and nihilistic, making it tough to experience. That was not the case in this production. You are blessed with a fine crew who loves to take part in the play and have fun with it. I recently discovered your blog and have made my way through 20 blogs already. Ionesco the Suite can't be known as a political play just on the grounds that it is too funny. But, it is also not a straightforward nonsense for it is excessively genuine. As a matter of first Assignment Help Sydney importance, it is the moment of genuine theatre that is both heart-breaking and killingly funny.